Dr. Tuttle grew up in Topeka, KS. He attended Kansas State University for undergraduate studies, graduating with a Bachelor of Science in Microbiology. He then earned his Doctorate of Dental Surgery from Creighton University in the spring of 2000. Dr. Tuttle is active in his community, church and profession. He has been involved in an annual dental mission trip to Guatemala for years, providing dental care to hundreds of impoverished children. He participates in various organizations, as well as continuing education to learn new techniques and skills; continually striving to ensure that each patient receives the best treatment available. He is a member of the Fifth District Dental Society of Kansas, American Dental Association and Kansas Dental Association. Through continuing education, up to the minute technology and state-of-the-art treatment, he is able to offer your family the high level of care you are looking for. Providing the most advanced dental care in a comfortable and relaxing atmosphere are the priorities of Dr. Tuttle. She is diligent in her pursuit to stay current in providing state-of-the-art technology, supplies and equipment. Dr. Tuttle grew up in Northwest Kansas and graduated with a bachelor degree from Kansas State University. She earned her Doctor of Dental Surgery degree from Creighton University in 2000. Dr. Julie completed a General Practice Residency at the University of Alabama at Birmingham to further her knowledge. She is a member of Fifth District Dental Society of Kansas, American Dental Association and Kansas Dental Association. 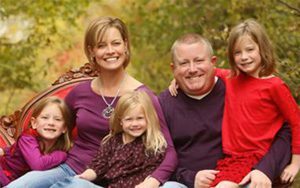 When Dr. Julie is not working at TFD, you can usually find her volunteering at church or school; and staying very active with their three girls.